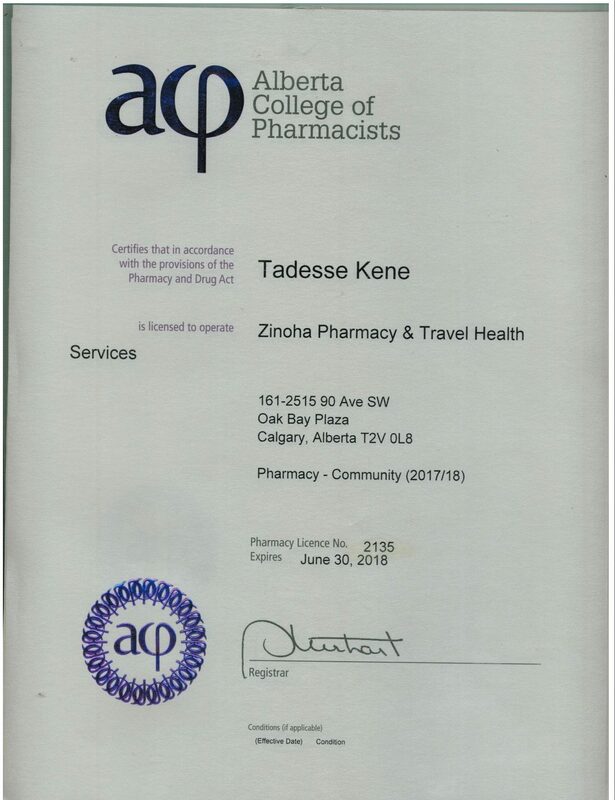 We are your neighbourhood Pharmacy located at Oak Bay Plaza, #161, 2515 – 90 Ave S.W, Calgary, Alberta, right next to the Oak- Bay Family Physicians Clinic. Our purpose and vision is to serve and extend our professional help to families in the community and beyond. Your pharmacist at ZINOHA PHARMACY always will help you make the best choices for your health. If you have any questions regarding medications used in the treatment of your medical condition please contact our knowledgeable staff at ZINOHA Pharmacy. NEW!! Our Travel Clinic is open now!! Please click on the top left logo button for more information. The name ZINOHA is derived from the names of the Three Beautiful Children with whom we are blessed.